Test numbers reveal a minimum of 20% more water flow rather through Green JacketTM over Warm&Dri foundation boardTM. Greater drainage rates means more water reaches the footer when it is needed, reducing the impact of water pressure on the wall and reducing the possibility of leaks or structural damage. The gravel test video demonstrates the durability of Green JacketTM over the fiberglass board. Delta Drain; 8’ x 65.5’ Protection –Drainage Product! Delta Drain is a multilayer geocomposite combining high density polyethylene core with a geotextile, bonded to the core for lasting durability. Delta Drain creates an essential path for the vertical and horizontal drainage of soil moisture and filtering of soil particles while offering hydrostatic pressure relief. See spec sheet for more info. Each kit has: 200 nails, 75 fasteners, 2 tubes of caulk, 13 termination bars, 1 kit covers 1 roll. 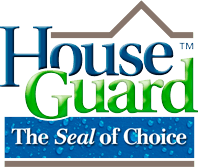 In 1995 HouseGuard was the first manufacturer to combine the Dow Perimate Board R-5 and R-10 with the TruDry™ waterproofing membrane making it the HouseGuard Waterproofing System. When looking for a product that offers a true R value in wet conditions, protection against backfill and drainage, the Dow Perimate offers two great products, R-5(1”) and the R-10 (2”). .
Drainage Grooves-The STYROFOAM insulation board’s drainage grooves are specifically designed to drain water away from the foundation walls, channeling ground water down to the drain tile. The extruded polystyrene of 25 psi protects the membrane and becomes a front line defense against hydrostatic pressure.